Chamber Music at the Clark concert seating is determined via lottery. The booking-by-lottery entry form for Dover Quartet concert seats posts here on Thursday, March 3, 2016. Lottery registration closes Thursday, March 24, 2016. The Dover Quartet catapulted to international stardom following a stunning sweep of the 2013 Banff International String Quartet Competition, becoming one of the most in-demand ensembles in the world. The New Yorker recently dubbed the group “the young American string quartet of the moment,” and The Strad raved that the musicians are “already pulling away from their peers with their exceptional interpretive maturity, tonal refinement and taut ensemble.” In 2013–14 the ensemble became the first ever Quartet-in-Residence for the venerated Curtis Institute of Music. 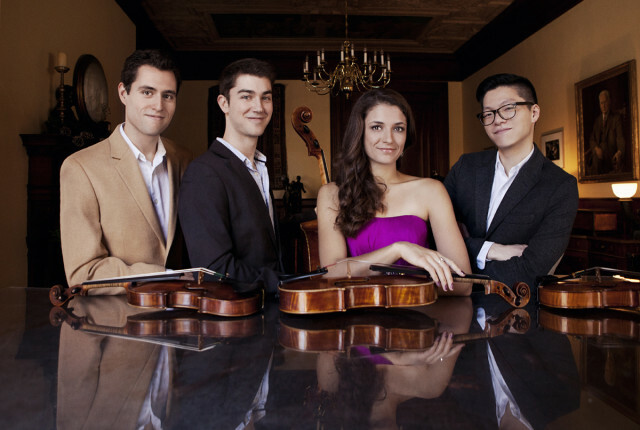 In addition to its success at the Banff Competition, the Quartet also won top prizes at the Fischoff Competition and the Wigmore Hall International String Quartet Competition. The group draws from the musical lineage of the Cleveland, Vermeer, and Guarneri Quartets, having studied at the Curtis Institute and Rice University’s Shepherd School of Music, where it was in residence from 2011 to 2013. The Dover Quartet is dedicated to sharing its music with underserved communities and is an active member of Music for Food, an initiative to help musicians fight hunger in their home communities.